One of my favourite films growing up was (weirdly?) WWII comedy Kelly’s Heroes. Despite starring Clint Eastwood and featuring a parody of The Good, The Bad and The Ugly, it’s definitely not a Western… but it did start me off on a Sunday afternoon obsession with cheesy cowboy films – something about all those sweeping panoramas, big skies and (let’s face it) leathers makes them a visual treat, even when the storylines leave something to be desired. Three families, with only a few wagons and oxen as possessions, head West on the high desert in 1845, led by a garrulous but evasive tall-tale artist named Stephen Meek, who may or may not be taking them to a beautiful valley in Oregon. When they capture a lone and unhappy Indian, Meek wants to kill him, but Emily —one of the wives, a woman of strong, steady character—protects the Indian, who just might bring them to a lake or a river. The journey from nowhere to nowhere becomes an absurdist quest, as if John Ford had been overtaken along the trail by Samuel Beckett. Kelly Reichardt moves us from the grandiosity of Western myth to the bone-wearying stress of mere existence. She gives us a new kind of feminist and materialist realism, with an emphasis on repetitive work, much of it done by the women. It’s a pleasureless, anti-sensuous aesthetic, but the movie, in its thorny, grudging way, is stirring, with many startling details. I read a really good interview with Kelly in the Guardian a few weeks ago which provided an insight in to the dedication that went in to the production. 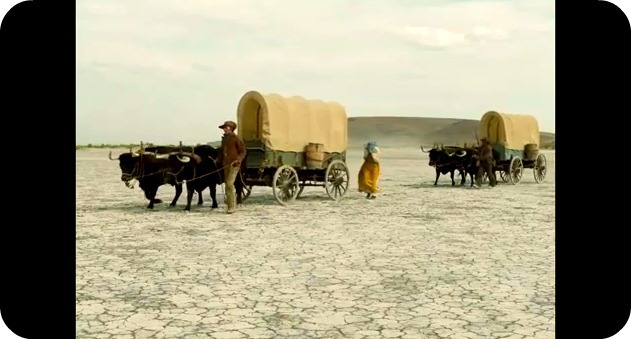 They used wagons from the period and as the film was shot chronologically on a super-tight deadline and budget, the actors weren’t allowed to change or clean their costumes. COOL! In the aforementioned interview the Guardian said: “there’s no room here for the niceties of costume drama.” I dunno – all those vibrant colours against the wide arid sandy panoramas work pretty nicely for me. Out now // Watch the trailer here!